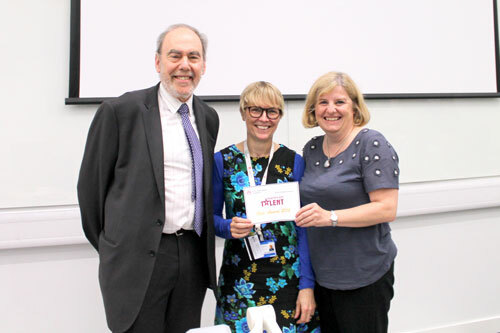 The School of Health Sciences held its fourth annual 'Health Has Got Talent' event last week to promote excellence in education within the School. Staff were asked to submit a project or innovation that they thought was worthy of recognition. Presenting their idea to an audience of their peers from across the School at an event in the Drysdale Building, a panel of three judges – including Professor Pam Parker (Learning Enhancement and Development - LEaD), Professor Stan Newman (School of Health Sciences) and Dr Wayne Holland (Cass Business School) - chose the most innovative project with the winner receiving funding to further support its development. In an extremely high-quality field the winning project was created by Karen Rawlings-Anderson and Janet Hunter from the Division of Nursing. The project, called ‘Creative Ideas: from a scrap of paper to commercial enterprise – The Drug Round Game’, developed a game to help health professionals to reduce mistakes with medication, ensure safe clinical practice and avoid clinical harm. Karen and Janet worked with Focus Games and the City Enterprise office to manufacture the game, and students found it very useful when it came to preparing them for their roles in the workplace. The second placed initiative was a tie, with ‘Bridging technology and simulation – use of empathy suits in the Technology Enabled Care Studio (TECs)’ by Janet Hunter, Karen Rawlings-Anderson, Shashi Hirani and Lorna Rixon and ‘Showcase a Cell: Engaging, Enthusing and Enabling Nursing Students in Bioscience’ by Sarah Greenwood and Sheila Grandison both jointly awarded the silver prize. The simulation suits project used the new City TECS flat as an environment to simulate care in the home for community nurses. This added a realistic dimension to the learning process and enhanced student engagement while also preparing them for professional practice in an immersive learning environment. Both older adult and bariatric suits were used to show students the issues older and obese patients may face, and enabled them to discuss the challenges of managing care in the community. The project by Sarah and Sheila looked to show students that learning about bioscience – which while critical for safe and effective nursing care can often be complicated and confusing – can also be fun and engaging when approached creatively. When working with students they used creative materials such as plasticine and artistic materials to make some of the concepts explored in class, such as the cell, respiratory system and nerve cells. This helped when learning difficult concepts and also showed students how nursing works in relation to biology. Third place was also tied, this time between three projects, with ‘A creative way to introduce library resources to first year nurses and midwives’ by Catherine Radbourne and James Atkinson tied with a project by Shashi Hirani and Lorna Rixon titled ‘Engaging Technology in Health and Social Care: Introducing City TECs – Technology Enabled Care Studio’. The final project by Lorna Saunder and Sandra Partington, which was titled ‘CityScape – moving beyond indifference’, used multimedia to develop student knowledge, values and skills around learning disabilities.